Nothing is perfect. Neither our life nor us. Everything good or bad happens for a reason. Some leave you happy and some leave you distraught. Author Priyanka Bhardwaj in her debut novel "Red is for Love, Black is for Kohl" has penned down a story of one such life. So has she been able to pen it down perfectly? Let's find out. Naina Shergil, a literature student at the University of Delhi, is headstrong, super-smart, ambitious, and like several others her age, juggling so many college activities with her search of the perfect love. Her bland spell of a boyfriend-less routine, is suddenly broken when she bumps into a hot young designer who twists her world sideways. Is their relationship destined for sweetness or just another cruel joke? Who is Aarian Mehra, and why does he always manage to turn up in her life at the worst of times? Meanwhile, her closest friend and roommate Niti, disappears one day, leaving behind a note cautioning Naina to not look for her anywhere. Helpless, Naina pairs up with childhood friend Kritti to return home for a family wedding, save a love marriage, and comes back only to be shocked by a couple of developments. 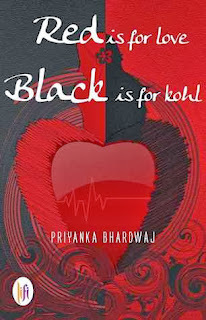 Filled with steamy scenes, bullying, ragging, jealousies, a Goa trip, hard-core partying, bureaucratic problems and the rough and smooth of life and daydreams, Red is for Love... is a ready companion to be savored as much in the Metro as in the Mercedes, and an ode to the joys of being young and fancy-free in dark, dangerous Delhi. First look at the title and the cover and a lot of things will intrigue the mind of the readers. The title quite unusual for a book but conveying a meaning when one delves deep in to the realms of it. The cover image contains both the colors mentioned in the title probably hinting at something which has to be deciphered by the readers. The blurb talks about a girl and her life. It's a good blurb but could have been cut down a bit more. It reveals a bit more than what was required from it. The story revolves around a typical Punjabi girl Naina Shergil whose life is centered on friends, family and other acquaintances. Her bold and never die attitude helps her getting along with many and getting over her past. But when she falls in love again her life comes to a standstill. Her equation with many change and then life takes a drastic turn and in comes Aarian Mehra to fill up the void left by some people in her life. From there on it's tiff between her mind and her thoughts and actions as all of them scuffle to over power her completely. Where will life take Naina? What role Aarian will play in her life? Will she be able to get some clarity? This is what the story is all about. Love, drama, emotions,naughtiness, friendship, carefree attitude, typical city set ups, Delhi college life it's all there in the book and in sufficient quantity to entertain and enthrall the readers. A quick first half is followed up by an emotional and curiosity filled second half. There is a certain amount of flair in the narration and takes a cue out of many real life scenarios on the way. The blend of all good and bad in life has been done up to perfection. The poems composed in the book are deep and meaningful. The authenticity of the whole setup leaves a good impression while reading the book. The downside of the book is it's slowness in the middle of the story. A bit of emphasis on kohl could have been cut down to make it look more appealing. Overall it's a ride which all the readers would love to take up one time with the protagonist Naina. It's an up down story with lots of events happening in and around the book to keep the readers hooked till the end. A few ifs and buts in the middle won't take the charm away instead the curiosity factor will take the readers till the last page and leave you in gasps for a few moments. It's a story of actions and reactions.